Floor Area 1,500 sq mtrs. A truly unique fully detached villa occupying an elevated position boasting 360° sea and country views. The property has large iron gates through to drive way and a very impressive pool deck area with barbecue and more than adequate space to entertain and impress friends and relatives with this superbly appointed and presented home, having what has to be said one of the most peaceful and idyllic location you are likely to find. 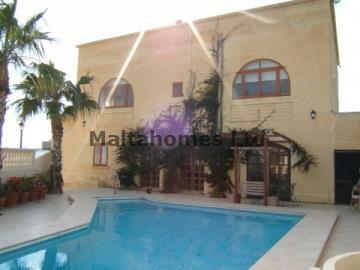 Words are not enough to describe this dream property, internal inspection is highly recommended, together with external inspection to which you will determine one of the finest views on Gozo.